Finding plants for their eggs is the only parental care shown by many winged insects. Hatched juveniles often feed on one individual plant until gaining the power of flight as adults. Females are therefore predicted to lay more eggs on plants supporting high offspring survival. Many experiments comparing egg-laying and offspring survival across plant species refute this, leading to alternative concepts including ‘enemy free space’, ‘optimal bad motherhood’ and ‘neural constraints’. Whether tested plants have the same geographic origin as the insect is often overlooked. Using 178 oviposition–performance studies, we found when insects and plants share a native range, 83% of insect species associated their eggs with plants conferring highest offspring survival. This was broadly true across insect taxa and for generalists and specialists. Only 57% did so with non-native plants. That females are attracted to hosts with high offspring survival is a well-supported theory that does not necessarily apply to exotic host plants. The online version of this article ( https://doi.org/10.1007/s11829-019-09688-x) contains supplementary material, which is available to authorized users. The life cycle of most insect herbivores involves a transition through a flightless juvenile life stage that grows by feeding on its host plant. Only at the adult stage does it become capable of flight, and, if female, search for suitable sites to lay eggs (Swammerdam et al. 1792). Adult insects should, in theory, be under selection to lay eggs on the host plants most suitable for survival of their offspring. This hypothesis was articulated in a verbal model by Wiklund (1975) and expressed mathematically in terms of optimal oviposition behavior by Jaenike (1978). Mixed results from a number of early empirical studies led Thompson (1988) to propose four variables that could explain this detected mismatch between oviposition and performance across studies: time required for adaptation to novel hosts, variance in natural enemy density across hosts, rarity of host plants, and selection of hosts based on presence of adult food sources. Other possible complications include larval dispersal (Dethier 1959; Holliday 1977) and limits to information processing by insect brains leading to failure to reject unsuitable plant species with similarities to a host plant (Nylin et al. 2000; Cunningham 2012). The preference–performance hypothesis was more extensively analyzed by Mayhew (1997), using 111 species reported in studies published between 1970 and 1996. This analysis found the hypothesis was upheld in only 55% of tests. More recently, Gripenberg et al. (2010) conducted a meta-analysis of preference–performance literature and found a significant overall correlation between insect preference for oviposition sites and offspring performance at those sites, with the correlation tighter for specialist insects than for generalists. Their statistical methods, however, had the drawback that relatively few studies could be included, with only 21–29 insect species ultimately being included per response variable (preference, survival, development time and weight). We felt we could substantiate generalizations regarding the preference–performance hypothesis by addressing four issues we deemed likely to affect interpretation of the body of preference–performance literature. Each of these new criteria is, potentially, an example of false analogy. First, the preference–performance hypothesis has been applied broadly to include not just oviposition and larval performance across host plant species (e.g., Wiklund 1975; Rausher 1980), but also across different quality conspecific plants (e.g., Janz and Nylin 1997), crop cultivars (e.g., Rahman et al. 2010), different parts of the same plant (e.g., Kogel 2002), sunny or shady positions on plants (e.g., Cardenas and Gallardo 2013) and herbivore-induced plants versus non-induced ones (e.g., Wise and Weinberg 2002; Soler et al. 2012). Neither of the earlier analyses (Mayhew 1997; Gripenberg et al. 2010) differentiated studies that compared oviposition and performance across host species from those involving various aspects of intraspecific plant variation. Such inclusive analyses are likely to mask patterns within the different categories of tests, despite the validity of each in its own right, and may bias overall conclusions drawn. For instance, the butterflies Vanessa cardui L. and Polygonia c-album L. (Lepidoptera, Nymphalidae) each laid equal numbers of eggs across conspecific plants of varying physical condition (Janz and Nylin 1997), but when tested with different plant species conferring different levels of larval survival they did lay adaptively according to the preference–performance hypothesis (respectively, Janz 2005; Nylin and Janz 1993). Whether the preference–performance hypothesis is supported can thus depend on how it is applied, with evidence from different categories of test providing different levels of understanding of the host–species relationships of these insects. Second, insect herbivores cannot be expected to show adaptive patterns of host use if they have been introduced only recently to environments with different plants, or if exotic plants invade the insect’s habitat, as they would not have had time to evolve (Wiklund 1975; Thompson 1988), assuming that they eventually do adapt to such circumstances. Yet numerous studies explicitly aim to test the validity of the preference–performance hypothesis, an evolutionary question, but include host plants exotic to the insect’s native range in the study. Perhaps unsurprisingly, such tests often report that preference and performance are not linked (e.g., Fox 1993; Ekbom 1998; Berdegue et al. 1998; Martin et al. 2005; Balagawi et al. 2013; Hufnagel et al. 2016). If cases such as this are not separated from tests where the insects and plants share the same native distribution, they may bias estimates of the validity (or otherwise) of the preference–performance hypothesis. A third issue is that a mismatch between oviposition and larval performance does not necessarily indicate oviposition on hosts of lesser quality for larval development. In some studies, the larvae survive and develop similarly across a set of species but adults lay significant numbers of eggs on only one or some of these (e.g., Roininen and Tahvanainen 1989; Scheirs et al. 2000; Ladner and Altizer 2005). While such an outcome technically violates the preference–performance hypothesis, it could have fitness consequences only if the attractive host is periodically unavailable or if larvae reach damaging densities locally. Such situations are, therefore, very different to a maladaptive situation of many eggs being laid on a host that does not support larval survival and/or development to the same extent as does a host that receives fewer eggs (e.g., Courtney 1981; Brodbeck et al. 2007). In this analysis, we therefore separate each negative result into either of two categories: ‘fewer eggs on high survival host’ (females lay significantly fewer eggs on host plant(s) with survival rates that are not significantly different to other hosts tested) and ‘many eggs on low survival host’ (females lay as many or more eggs on host plant(s) with significantly lower juvenile survival than other hosts tested) (Fig. 1). A final possible issue is that over half of all preference–performance studies are conducted with lepidopterans (see “Results” section), most of these butterflies. If Lepidoptera is not a representative taxon among insect herbivores, there is again the potential for bias if preference–performance studies on butterflies are extrapolated to insects in general. This analysis explores the association between oviposition and offspring performance across different host plant species, with tests involving variation within a plant species not included (issue 1 detailed above). Tests with plants from the insects’ native range were considered separately from those using plants exotic to the insects’ original geographic distribution (issue 2). Negative results in these tests were assigned to one or other of the separate outcomes: ‘fewer eggs on high survival host’ and ‘many eggs on low survival host’ (issue 3, Fig. 1). Using the studies compiled with these considerations, three questions were addressed: (1) What proportions of insect species tested with plants from their native range, versus those tested with exotic plants show the outcomes: (i) positive relationship, (ii) fewer eggs on high survival host or (iii) many eggs on low survival host? (2) Are generalist insects more likely to place eggs on host plants with low survival rates (many eggs on low survival host) than specialists? 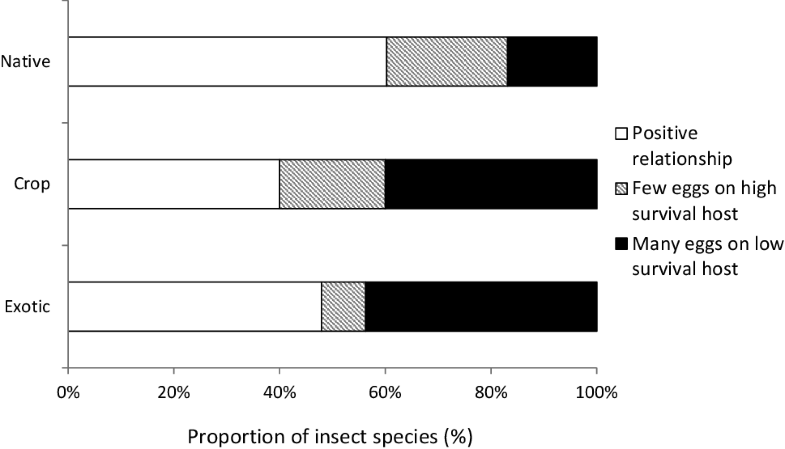 (3) Do test results differ across insect taxonomic groups (issue 4)? To find studies that tested ovipositional preference and offspring survival of insects across host plants, preliminary searches were made using the keywords ‘preference’ or ‘oviposition’ and ‘performance’ or ‘survival’ in BioOne journals and Google Scholar databases, and studies extracted by inspection of the first 50 to 100 references returned in these searches, as ranked by relevance of keywords in each catalogue. Additional studies were tracked down in the bibliographies of papers found with the above search method. All studies in the appendices of Mayhew (1997), Gripenberg et al. (2010) and Yoon and Read (2016), and in a table compiled by Berenbaum and Feeny (2008), were examined to extract further studies relevant to this analysis. The lists of literature returned by Google Scholar that referred to each of three highly cited papers: Mayhew (1997), Gripenberg et al. (2010) and Berdegue et al. (1998) were examined likewise. To check for additional studies missed by the above methods, a search in Web of Science was made using the advance search terms “Topic = oviposition AND Topic= (performance OR survival) AND Topic = insect” and relevant studies identified by looking through all 1733 search results of studies published until the end of 2017. A final search used Google Scholar with the chain of keywords: oviposition preference performance survival host plant. This yielded around 20,000 results ranked by relevance to the keywords, of which the first 980 (the maximum Google Scholar would load) were scanned for relevant studies not picked up by the other search methods. Papers were assessed and tabulated to record whether the results demonstrate a relationship between insect oviposition and offspring survival. Only studies that explicitly assessed oviposition across host plant species, either in the field or (more typically) in laboratory tests, were included. Likewise, only studies that tested offspring survival rates (not just growth rates) as part of a proxy for performance were included, as we judged this to be a more important measure of performance. This is supported by a systematic review that has shown little support for the ‘slow growth, high mortality’ assumption behind using development time as a measure of fitness (Williams 1999). For each insect species studied under these criteria, we recorded whether a positive relationship was detected between preference and performance and, if not, whether the species fell into the ‘fewer eggs on high survival host’ or ‘many eggs on low survival host’ categories. To be labelled as showing a positive relationship, offspring survival in the study (or other proxy measures of fitness such as pupal weight or growth rate, if survival did not differ significantly) must have been higher on host plants receiving significantly more eggs than another. If, however, two or more hosts conferred the same offspring fitness but one received significantly more eggs than another, then the study was labelled ‘fewer eggs on high survival host’. And if a plant significantly worse for offspring fitness received an equal number or more eggs than a more suitable host plant, the study was labelled ‘many eggs on low survival host’ (Fig. 1). We recorded if the species was a generalist or specialist herbivore—with generalists defined here as those species feeding on host plants in four or more families, as did Bernays and Graham (1988). The studies were also separated by whether the plants tested originated from the same geographic region as the insect(s) did, and if they were cultivated crop species. If the native ranges of the insects and plants were not mentioned in the paper under consideration, the relevant details for the species concerned were located using the online databases Catalogue of Life (Catalogue of Life Global Team 2018), Global Biodiversity Information Facility (GBIF.org 2018), Featured Creatures (University of Florida (2018) or Plants of the World Online (Kew Science 2018), or from another reference [in which case it is listed as a footnote to the relevant table (Tables S1–S6, supporting information)]. If a study used a mixture of native (to the insect’s native range, not necessarily the study area) and non-native or crop host plants, and at least two native plant species were included, the results were also reinterpreted separately by considering only those results obtained with respect to the native species. The exception to this was the situation where most of the eggs in a multi-plant choice test were laid on the exotic hosts, in which case that study was included in the non-native species category only. Some of the studies included additional field experiments to test whether natural enemy defense or avoidance varied across hosts, and we recorded the results of these tests separately. The same was done for tests of the ‘optimal bad motherhood’ hypothesis. In this way, we assessed how commonly enemy free space or more attractive adult food sources have been demonstrated to occur on otherwise lesser hosts, and whether including natural enemies significantly increased the predictive power of the preference–performance hypothesis. Each species was treated as an independent datum within native host, non-native host and crop host groups. The native and non-native groups were subdivided into specialist and generalist groups, although generalists and specialists were later pooled within each as they did not differ from each other, and the pooled species tested with native hosts then split for comparison by insect order. Comparisons of the number of species showing positive, ‘fewer eggs on high survival host’ and ‘many eggs on low survival host’ relationships were made across groups using Chi-square or Fisher’s exact tests depending on sample size. If a species had been tested in more than one study for either non-native or native hosts with different results (which was the case for 14 species), then the most common outcome was used if there was one. Species with one positive and one negative result were conservatively interpreted as negative data (e.g., ‘positive/fewer eggs on high survival host’ taken as ‘fewer eggs on high survival host’). We favored this vote counting method over a meta-analysis because it allows all relevant preference–performance studies to be included, regardless of the type of data and analyses used, and also because finding the proportion of species that show adaptive egg-laying behavior seems a more informative way of assessing generality of the preference–performance hypothesis than computing an average effect size across species. Our search yielded 178 journal articles on 161 herbivorous insect species (85 Lepidoptera, 28 Coleoptera, 19 Diptera, 17 Hemiptera, 10 Hymenoptera, 1 Orthoptera and 1 Thysanoptera). These are sub-divided into 13 generalists and 70 specialists with native hosts (Tables S1, S2), 36 generalist and 56 specialist species tested with exotic hosts (Tables S3, S4), and 20 species tested with crops developed from plants native to the same region as the test insect (Table S5). These sub-totals do not add to 161 because several insect species were tested with both native and non-native/crop plants. Thirteen of the studies involved 10 insect species for which information could not be found on the native range of the insect or host plants, or on whether the insect was a generalist or specialist (Table S6). Those with missing information on native range were excluded from all analyses. The other three studies, where native ranges were known but not host specificity, were excluded from the generalist–specialist comparisons but included in a subsequent analysis where generalists and specialists were pooled. Of 13 generalist species that have been tested with native host plants, 7 showed a positive relationship between oviposition and performance, 4 laid fewer eggs on high survival host(s) and 2 laid many eggs on low survival host(s) (Fig. 2, Table S1). Among the 70 specialist species, oviposition matched performance in 43, 15 laid fewer eggs on high survival host(s) and 12 laid many eggs on low survival host(s) (Fig. 2, Table S2). The outcome frequencies did not differ significantly across generalists and specialists (Fisher’s exact test, p = 0.84). 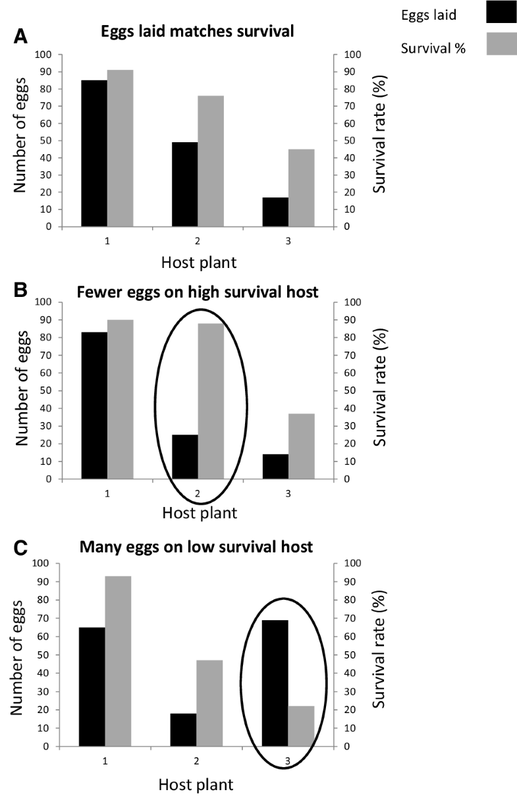 Of the 37 generalists tested with non-native host plants, oviposition matched performance for 16 of them, 1 laid fewer eggs on high survival host(s) and 20 laid many eggs on low survival host(s) (Fig. 2, Table S3). 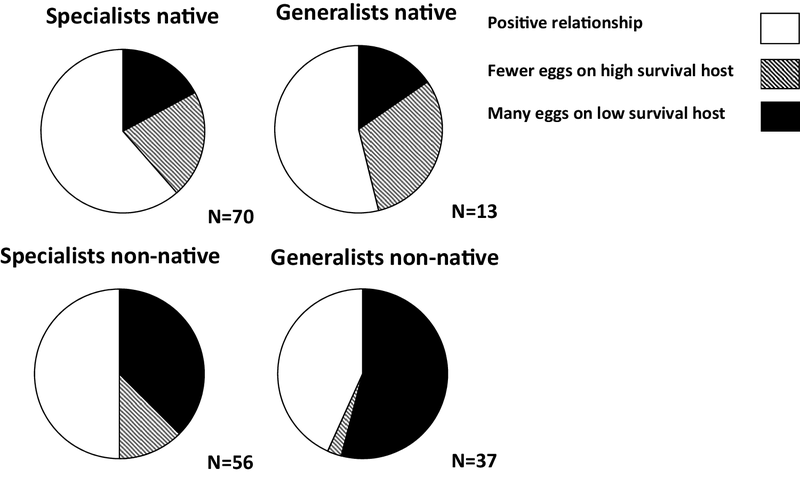 Of 56 specialist species tested with non-native hosts, 28 had oviposition matching performance, 7 laid fewer eggs on high survival host(s), and 21 laid more eggs on low survival host(s) (Fig. 2, Table S4). These proportions were not significantly different from those of generalist species (Fisher’s exact test, p = 0.14). Of 83 insect species tested with plants from their native ranges, there were 50 whose oviposition rate matched the survival of their offspring (positive relationship), 19 laid fewer eggs on high survival host(s), and 14 laid many eggs on low survival host(s). By contrast, of the 20 species that were tested with crops derived from their native ranges, 8 showed a positive relationship, 4 laid fewer eggs on high survival host(s), and 8 laid many eggs on low survival host(s) (Table S5), a result close to that of non-native plants where 46 showed a positive relationship, 8 laid fewer eggs on high survival host(s), and 42 laid many eggs on low survival host(s) (Fig. 3). The difference in proportion of insects laying many eggs on low survival hosts across the native and non-native tests is highly significant (χ2 = 15.0, p = 0.00011). Fourteen species tested with native hosts were attracted to a nutritionally less suitable host for their larvae (many eggs on low survival host). For two of these: Oreina elongata Suffrian (Coleoptera, Chrysomelidae), a specialist (Table S2), and Parrhasius polibetes Stoll. (Lepidoptera, Lycaenidae), a generalist (Table S1), lower rates of predation and parasitism, respectively, on the host where more eggs were laid meant this behavior was, on the whole, seen to be adaptive (Ballabeni et al. 2001; Rodrigues and Freitas 2013). There was also a case of ‘fewer eggs on high survival host’ explained by the need for Phratora vitellinae L. (Coleoptera, Chrysomelidae) beetles to sequester plant toxins as a defense (Denno et al. 1990, Table S2). One other study testing natural enemy effects, with Epilachna pustulosa Kôno (Coleoptera, Coccinellidae) beetles, showed that a host plant with high laboratory survival also had fewer predators, although frequent defoliation associated with high larval densities evidently countered this advantage (Yamaga and Ohgushi 1999). For only one species, Micrurapteryx salicifoliella Chambers (Lepidoptera, Gracillariidae), was something similar to the ‘optimal bad motherhood’ hypothesis (Mayhew 2001) supported, with larvae performing best on plants with trichomes, on which the adults laid fewer eggs (Wagner and Doak 2017, Table S2). Four other studies that tested this hypothesis with native plants (all tested adult feeding as a trade-off against offspring survival) yielded results inconsistent with prediction. Two found higher larval performance on hosts more attractive for both adult feeding and oviposition, with Vanessa cardui butterflies and Manduca sexta L. (Lepidoptera, Sphingidae) hawkmoths (Janz 2005; Smith et al. 2017). In a third, oviposition rates by bronze bugs Thaumastocoris peregrinus Carp. & Del. (Heteroptera, Thaumastocoridae) across host species matched performance across the hosts, whereas different plants were used for adult feeding (Martinez et al. 2017). In the remaining study (Scheirs et al. 2000), adult feeding appeared to explain why Chromatomiya nigra Meigen (Diptera, Agromyzidae) laid fewer eggs on a high survival host, but this is also not a valid example of optimal bad motherhood. With these considerations together, only 1 of 13 generalist and 10 of 70 specialist species (13.3% of total) had oviposition behavior that did not match predictions of the preference–performance hypothesis, nor was demonstrated to be explained by an alternative hypothesis. In all five insect orders that were tested with native hosts (Lepidoptera, Coleoptera, Hemiptera, Diptera and Hymenoptera), the most common test outcome was a positive oviposition–performance relationship. The distributions of the three test outcomes (positive relationship, fewer eggs on high survival host and many eggs on low survival host) were similar across taxa (Fisher’s exact test, p = 0.83) (Table 1). Most species were tested in only a single preference–performance study, but 9 species were tested independently 2–4 times with native hosts and 16 species tested 2–4 times independently with non-native hosts. For the tests with native hosts, 5 out of 9 showed consistent outcomes, with a further 3 showing both a positive relationship and a ‘fewer eggs on high survival host(s)’ outcome and one species showed all three outcomes (Table 2). The tests with non-native plants were almost entirely inconsistent within herbivore species, with only 5 of 16 showing consistent outcomes (Table 2). Note that these are not replication studies, as different studies done with the same insect species often tested different plant species and may have used different methods. The results presented above reveal predictions of the preference–performance hypothesis to be mostly accurate for insects interacting with hosts from their native ranges, with 83% of species placing most of their eggs on either the best plant(s) or the equal-best plant(s) for their offspring. This conclusion can probably be generalized for specialist and polyphagous species across the major taxonomic groups of insect herbivores. Given that this level of support is demonstrated without considering natural enemies or adult feeding, it follows that ovipositing females are attracted primarily to plants to which the feeding behavior and physiology of the juveniles are adapted. The much higher incidence of insects laying many eggs on low survival host(s) (rather than the less problematic ‘fewer eggs on high survival host(s)’) when exotic host plants are included in tests show that insects do not necessarily adapt rapidly to a modified host-plant environment in which their host recognition process leads to inappropriate placement of their eggs. This ‘evolutionary lag’ postulated by Chew (1977), but rejected by Courtney (1982), is quite clearly a fundamental consideration in insect–host plant relationships (Fig. 3). Poor survival on novel hosts, referred to as ‘ecological traps’, are common among the Lepidoptera (Yoon and Read 2016), which these results support. This has conservation implications for rare insect species now faced with unusually high numbers of exotic plants introduced by humans. Examples include Ornithoptera richmondia Gray (Lepidoptera, Papilionidae), the threatened Australian Richmond birdwing butterfly, which oviposits on invasive dutchman’s pipe Aristolochia macrophylla Lam. (Aristolochiaceae), a weed that is deadly to the larvae (Sands 2008), and Pieris virginiensis Edwards (Lepidoptera, Pieridae), the west Virginia white butterfly, which is more attracted to toxic garlic mustard Allaria petiolata (M. Bieb.) Cav. & Gr. (Brassicaceae) introduced from Europe than to its native host (Davis and Cipollini 2014). Nonetheless, slightly more than half (57%) of insect species tested with exotic host plants did still lay more eggs on hosts beneficial to their offspring (Fig. 3). This suggests there is commonly some relationship between similarity of volatile compounds used as recognition cues across exotic and ancestral hosts and similarity in the suitability of the plants to the juvenile stages. This could either be because chemical similarity reflects relatedness of host plants, or because having similar volatiles is a predictor of similar chemical suitability regardless of plant ancestry. Generalist insect herbivores, when tested with native hosts, seem as likely as specialists to lay eggs according to the preference–performance hypothesis (Fig. 2). This is contrary to conclusions of Gripenberg et al. (2010) that specialists had a stronger preference–performance linkage, which is easily explained by the fact that specialists have been twice as likely as generalists to be tested with native plants (Fig. 2; cf. Tables S1–S4). That generalists do perform much the same as specialists (when considered in relation to their native hosts) is probably because generalist species tend to be attracted primarily to a small subset of their full range of hosts and allocate a disproportionate number of eggs to these primary hosts (Walter and Benfield 1994; Rajapakse et al. 2006; Rajapakse and Walter 2007). Generalist feeding has clear advantages particularly in uncertain environments (Wint 1983; Velasco and Walter 1992) and is more commonly inferred as the ancestral state within insect clades (Nosil 2002; Janz et al. 2006). It therefore seems puzzling that more than 90% of insect species are specialists (Bernays and Graham 1988). Specialists may have advantages in ways that were not considered in this review, such as being more likely than generalists to reject unhealthy individual plants of a host species (Janz and Nylin 1997). Another explanation is that if generalists tend to be more geographically widespread than specialists, they may be less likely to undergo allopatric speciation (Jablonski and Roy 2003) and therefore remain less diverse. Further investigation is needed to determine which, if either, of these ideas could help explain the preponderance of host plant specialization in insects. These considerations on the relationships between adult oviposition and juvenile survival across host plants can be seen as part of a longer debate about what determines use of particular host plants by insect species. Dethier (1941, 1954) emphasized plant chemistry as incidentally providing olfactory and taste cues that insects use in host recognition, while acknowledging that survival on a recognized host was dependent on toxins and nutrients. Kennedy and Booth (1954) thought that insect feeding preferences for host plants (determined by olfactory and tactile stimuli) were associated with the nutritional suitability of host plant material. This was questioned by Dethier (1954) on the grounds that chemical cues themselves have no nutritive value. Fraenkel (1959) argued further that defensive chemicals, not nutrients, limit survival on host plants, and defensive chemicals are used as cues by insects that have adapted to overcome the chemical defenses of their host plants. Ehrlich and Raven (1964) extended Fraenkel’s ideas into their co-evolution model, proposing insects with an adaptive advantage over a chemical defense can occupy an adaptive zone and diversify, until host plants evolve new defenses in response. However, Jermy’s (1984) analysis of regular patterns in the phylogenies of host plants relative to those of their insect herbivores showed that insect diversification follows that of plants rather than co-evolving (see also Percy et al. 2004). Frequent host switching means that related insects often feed on more distantly related plants (Jermy 1984). Jermy’s (1984) de-emphasis of plant defenses, along with claims of poor relationships between oviposition preference and juvenile survival on host plants (Thompson 1988), seems to have increased the popularity of natural enemies as an explanation for observed patterns of host use (Bernays and Graham 1988; Courtney and Kibota 1990). This, however, rests on the assumption that mortality from natural enemies differs significantly and consistently across hosts over evolutionary timescales. The conclusions derived from our analyses, that oviposition usually matches suitability of the host plant for the development of their immatures (Fig. 3), make sense in the context of year-to-year variation in relative host suitability with regard to natural enemies (Gratton and Welter 1999; Yamaga and Ohgushi 1999; Wiklund and Friberg 2009) and the frequency with which parasitoid species follow their host insect species when it switches to a new plant (Gratton and Welter 1999; Grosman et al. 2017). While generalist predators may be plant specific (Beard and Walter 2001; Grosman et al. 2017), as dietary generalists they are likely to prey on newcomer herbivores that have switched hosts. Consequently, the success of host switches by herbivorous insect species, if forced by environmental change such as colonization of a habitat without its primary host, is more likely down to preadaptation and subsequent adaptation to refine both the adult host searching mechanism and the biochemistry, physiology and behavior of immature stages to a new host (Mayr 1963; Walter 1993; Percy 2003). In a complete host shift, where an insect species adapts to feed on a host it would never have previously used, evolutionary change in oviposition behavior logically proceeds feeding adaptations of the immature stages, which are unlikely to adapt to a plant unless their parents place them there as eggs. Suppose, however, an insect species colonizes a new habitat (or novel plants invade its habitat) and it oviposits on several plant species of varying toxicity or nutritional adequacy for the juveniles, as in Wiklund’s (1975) thought experiment. Assuming the species or population does not simply go extinct, a positive relationship between oviposition rate and juvenile survival could be restored either by refinement of host recognition such that the host with highest survival becomes the most attractive for oviposition (possibly followed by some juvenile stage adaptation), or by the juveniles evolving to digest and detoxify a plant to which the females are attracted, thereby increasing survival rates (possibly followed by some refinement of oviposition behavior). Larval digestive capabilities have been regarded as slower to evolve based on sister species retaining adaptations for feeding on ancestral host plants on which the adults no longer oviposit (Nylin et al. 2015). But slower loss of an adaptation in disuse is not evidence that it responds any less to natural selection, and studies (of a similar nature) where one of the sister species has gained a host plant might better answer this question. Differences in oviposition behavior and/or larval performance have also been found within insect species across their geographic distribution. Generalist species may have populations of more specialized individuals (Janz and Nylin 1997; Meister et al. 2015), and there are cases of subspecies using different host plants altogether (e.g., Forister 2004; Althoff et al. 2014). On the other hand, there are species with broad geographical ranges whose host use is nonetheless consistent geographically (Wehling and Thompson 1997; Ladner and Altizer 2005; Rajapakse and Walter 2007). Individuals within the same area can vary in how specialized they are, such as in the oligophagous butterfly Papilio machaon L. (Lepidoptera, Papilionidae), where some individuals consistently refused to lay eggs on any plant but a primary host, whereas others would lay some of their eggs on secondary hosts (Wiklund 1981). This could facilitate formation of subpopulations where one or the other phenotype dominates. By contrast, subspecies specialized on different host plants (e.g., Althoff et al. 2014) would have required adaptive change to their host searching mechanism (a complex adaptation) and probably resulted from one of the populations being isolated from its host plant, forcing a host switch (see above), while retaining the same mate recognition process as the original population (Paterson 2005). Ultimately, it should be no surprise that juvenile survival matches oviposition behavior across host plants. Insects in their native habitats form stable associations with their primary hosts, with refined host recognition and host use adaptations (Ladner and Altizer 2005; Rajapakse and Walter 2007; Kelly and Bowers 2016). Survival rates will, in principle, remain lower on hosts upon which eggs are rarely deposited (unless the species happens to be pre-adapted to survive on that host), because natural selection for improved tolerance of these hosts will be weaker than that exerted by primary hosts where most individuals will be feeding. Note that under this autecological perspective (Walter and Hengeveld 2014) insect performance on a plant species is not about the relative quality of the plant as a resource. Rather, it is a consideration of how the life cycle of the insect species is adapted to the nature and structure of its environment, and in these cases the host plant provides a substantial part of that environment. 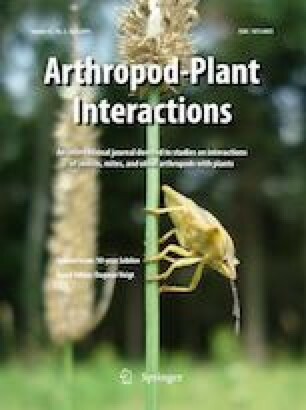 Consequently, as our data show, both host plant recognition and location by adult females and the physiological adaptations of juvenile stages for feeding on host plants are usually aligned with one particular host plant or a subset of primary hosts, and under stabilizing selection. Thanks to Mike Furlong and Bronwen Cribb (University of Queensland, Brisbane, Australia) for their help in the early stages toward development of this manuscript, and to Peter Mayhew (University of York, UK) for sending us the link to the raw data used in his 1997 systematic review.